You will notice that our attribute has custom backend and source models and that we apply it only to product types which require shipping method. First let’s take a look at our source model. For those that are not familiar with source models, their purpose is to fetch data for attribute. In our case it is a list of countries. Next we will look at our backend model. Purpose of backend model is to perform various actions on data that is stored in our attribute. For example we can validate data, modify before saving/after loading, etc. In our case we will use it to convert data from array (because we get array on input) to string before it is saved and other way around after our data is loaded. Once the attribute has been created, it will appear on the product edit page under General tab. Now that we can configure our products to block shipping for specific countries, we have to implement logic which takes customer’s cart items, compares them against entered shipping address and decides if customer is eligible to select shipping method and complete the checkout process. We cannot run our code immediately after the product was added to cart because there is no guarantee that we will have shipping address at this point. Instead, we have to wait for customer to start the checkout process. With that in mind, we will implement our code by class rewrite method. We will rewrite Mage_Shipping_Model_Shipping class and modify its collectRates method. It seems like a good place since we have access to customer’s shipping address, all the cart items and we can control which shipping methods are returned (in our case it will be either all or none). does not return any data at first. This is because Magento does not copy all the attribute data from product once it converts it to quote (cart) item. Luckily for us, Magento provides a mechanism to include additional attributes, all we need to do is write a few lines of XML. Adding the config lines was the last piece of puzzle. Basic functionality is now implemented, but obviously there is always room for improvement, especially on frontend, in terms of notifications and error messages for customer. This is something we will leave as an exercise for reader since main focus of this article was on backend implementation. Is it available in Magento 2? Hi Thank you, for the write-up. I was able to learn from following your steps. I got the code working in the backend. Any tips or guidance for the front-end. 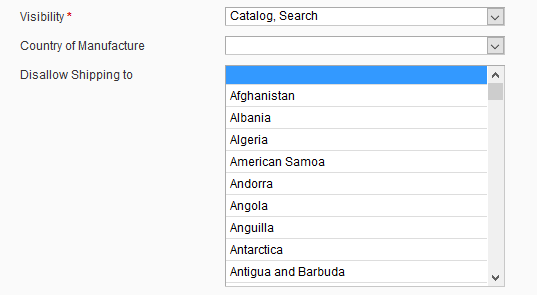 What I need is to disallow shipping to specific cities in one state, not per country. This tutorial helped me create my own module for such feature. Now I can restrict products to be shipped in specific cities in my state/province. Thanks! Hi. Please help. Thank you. Hi I am just new with Mage Dev and I want to edit some checkout codes. I am not sure how to start with this? If I create the attribute with a script, how do I run it and how do you create the folder structure of the custom extension? Thank you very much!